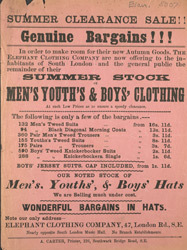 The late 19th century was the first time that retail outlets used a range of media to advertise their wares. Before this, advertisements were limited to text-only announcements of the store's opening times and specialties in weekly or monthly newspapers and periodicals. With the development of printing technology, however, the production of leaflets and posters such as this became both faster and cheaper.